Today the van underwent surgery – in fact it turned out to be like a trip to the dentists.. Recently my o/d (overdrive, top gear) stopped working, and I have been stuck with four gears, and a safe top speed of around 45mph without too much over revving of the engine. The automatic Hiace has a ‘o/d off’ button on the gear stick. You might use this if you wanted to hold 4th gear, for example when towing a heavy load downhill, to take advantage of engine braking, or to stop the engine jumping in and out of top gear on a gentle climb. The ability for the gearbox to shift into top gear is governed by a solenoid mounted on the rear transmission casing. It can be controlled by this switch, but is also governed by certain other conditions being met in the circuit controlled by an o/d ECU. (for example temp, and speed sensors can play a part in this). To try and repair my van, initially the transmission fluid had been changed, and the filter cleaned, and the engine temp sensor bypassed neither of which cured the problem. Then I had an auto electrician check the circuits for response – it appeared that it was unlikely the problem lay there. If it were possible to mechanically (hydraulically) bypass the o/d solenoid that would eliminate all electrics from the system, and mean that the gearbox will always shift into o/d at the appropriate speed. It is possible! 1. Go under the van on the passenger side (RHD van) and remove the rear driveshaft protection shield – 3x 12mm bolts. 3. Remove the rubber cap from the sensor beside the solenoid and remove the earth cable with Philips screw. 4. Now you can either drain the transmission fluid from the gearbox, or as I did, put an oil pan in position, remove the two 12mm bolts from the solenoid and quickly position a clean g-clamp over the hole when you remove the solenoid (make sure the outer o-ring remains in place to seal the hole, and the clamp can grip onto the trans pan – don’t over tighten) Catch leaking oil, which will spurt out, in the oil pan. 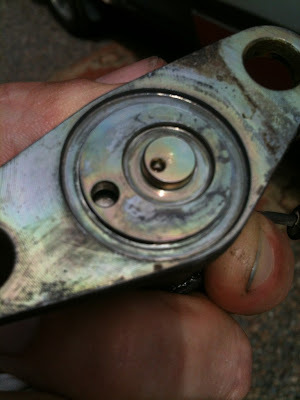 Remove the small rubber o-ring, and clean the solenoid well with a clean cloth, removing any loose particles, and as much trans oil as you can from the holes. You can now connect the solenoid to a 12v battery to test it – in the case of mine it did not operate. This means that the fluid never gets a chance to flow freely through the solenoid via these holes and allow the o/d gear to engage. To bypass this we must grind a channel to the depth of the small o-ring groove, between the holes. I used an air line to blast away any filings before removing the tape and the cloth. Make sure its as clean as possible prior to re-assembly. 7. Now fit the solenoid back on the transmission case using the outer o-ring only this time. 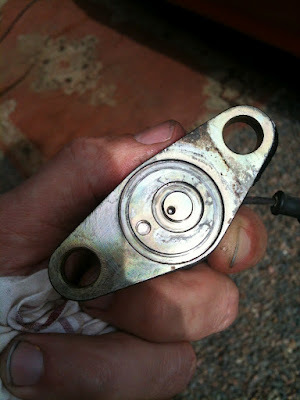 If you didn’t drain the transmission and used a g-clamp this will be messy, make sure and catch the oil that spills out. 8. You could just cut the wires off. I connected mine all back up (except the plug) in case I want to replace the solenoid in the future – I will have all the parts in the right places. 9. Filter the oil you caught through a stocking for example, to make sure its clean, and then using a funnel pour it back into the transmission through the transmission dip stick hole. (Or change your transmission oil if you drained the gearbox. Good idea to do this if it hasn’t been done in a while.) I recommend a full drain of the ATF oil to do this job, and a clean refill of oil afterward. Especially if it hasn't been changed in a while. 10. When everything is properly reassembled go for a test drive – you should now have your overdrive back again! (only now you cannot switch it off from the button on the gear stick). Mine changes super smooth at 45 mph – it always feels like it changes at the appropriate point for the driving conditions, revs etc. 11. Check for leaks around the solenoid when you get back, and over the next few days to make sure the seal is intact. 12. Remember to check the transmission fluid level after a day or two. I discovered that mine was a bit too high (possibly some had been trapped in the overdrive and released when the solenoid was freed up) as it had been last done with the solenoid out of action. Do leave your thoughts and experiences in the comments section and we can build up an additional resource for the future SC Hiace owners.. 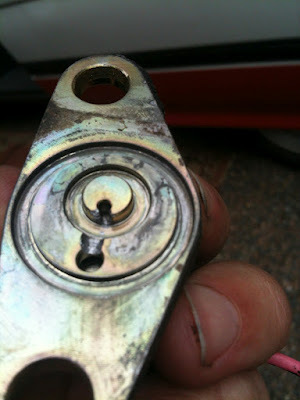 If this post helped you get your van back on the road, you have saved yourself a lot of money! If you can afford it, please consider making me a reasonable donation (the button is on the right side-bar) - I could certainly use it! Thanks! Take care, and see you soon! I have a slightly different problem: the gearbox “hunts” in and out of overdrive at speed: switches in and out of overdrive intermittendly at whatever speed above 82 km/h upwards: even at 140km/h. then sometimes works fine again for 10 or so kilometers, only to start hunting again, even at same pedal position on flat long roads. Oil ok, level clarity etc etc. Suggestions before I take a dose of rat poison ?? 1994 3L auto Turbo Diesel super Custom. I recently had the problem of reverse gear failing, and o/d slipping out once engaged. I left the van into Burnside Motors Coleraine N Ireland. Diagnosis was that all the clutches were badly worn. They did a great job, remanufactured the gearbox, all new clutch packs, seals etc – its now shifting perfectly! Also they endorsed my o/d soleniod bypass. 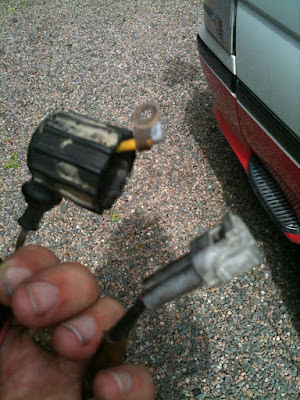 They sourced a replacement but it was very expensive for this van, so left the solenoid as I had done it. Reconditioning the gearbox is not cheap, but I’m happy to have her back and good for a long time to come. I also had the engine serviced, all filters replaced and everything else checked over while they had her in. The later models of Hiace Super Custom may have a different gearbox and solenoid, please leave a comment if you have any more details on this for other readers. Thanks. man you are a real genius!!! us with this article quit a bunch of money. this kind of surgery very much. I read your article yesterday after being told by a local auto transmission specialist it would cost me £200 plus to find the extent of the problem but that the cause could be a number of things and the gearbox may need a number of parts. The specialist said, worst case scenario, I could be £2500 worse off before I find out the box is finished. 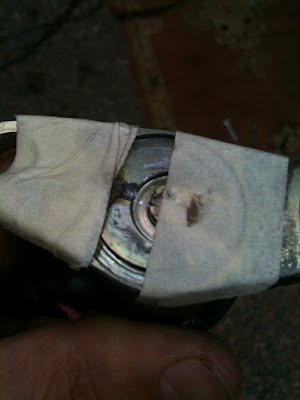 this guy was really helpful but given that a new solenoid offered no guarantee to cure the problem and that the £210 would be greatly needed for our temporarily postponed holiday, I decided to attempt your solenoid mod. I finished the job after 2 hours and just got back from a half hour test drive, I now know a new solenoid would not be a waste of money. Our holiday is now a reality. What a great place the internet can be.